Ion beam technology is an advanced technique which is primarily used across materials science, semiconductor industry and also increasingly utilized in biological field for ablation and deposition of materials and for site specific analysis. Ion beam systems have been commercially produced majorly for large semiconductor manufacturers for more than twenty years. These systems use focused ion beams that can be operated at high beam currents for site specific milling or sputtering or low beam currents for imaging. In addition, ion beam technology is also used commonly in order to prepare samples for transmission electron microscopes. While the mainstream application of ion beam systems remains within the semiconductor industry, the usage of these instruments has expanded to other application areas such as geology, forensics, biology, pharmaceuticals, composites, ceramics, and metallurgy. Ion beam technology has achieved widespread application in the fields of material science and biological science when it is coupled with a scanning electron microscope (SEM) column to develop a dual beam focused ion beam system. Moreover, new advancements are being constantly developed for nanotechnology and materials characterization. This vast range of applications is expected to provide the global ion beam technology market vast scope of development in the next few years. Transparency Market Research estimates that the market will exhibit a promising CAGR of 7.2% from 2017 to 2025, rising from a valuation of US$367.0 mn in 2016 to US$679.1 mn by 2025. The report segments the key applications of the ion beam technology into frequency trimming of bulk acoustic wave (BAW) filter, surface trimming of surface acoustic wave (SAW) filter, thickness and pole width correction of thin film recording head, and coating of dielectric film. Of these, the use of the ion beam technology for coating of dielectric films helps the global ion beam technology market earn the most significant share in revenue. The segment accounted for a significant share of 32% of the overall market in 2016 and is expected to continue to lead over the report’s forecast period as well, exhibiting a promising 7.5% CAGR from 2017 to 2025. The segments of frequency trimming of BAW filters and surface trimming of SAW filters, collectively holding a massive share in the market, are expected to witness healthy growth over the forecast period owing to the rising proliferation of smartphones and other mobile computing devices across the globe. The rising integration of wireless technology in smartphones is also expected boost the demand for ion beam technology in trimming applications in SAW and BAW filters. In terms of geography, the global ion beam technology market is presently dominated by Asia Pacific. The regional market held a massive 46.2% of the overall market in 2016 and is expected to remain at the forefront of all future development of the global market over the next few years. Growth of the Asia Pacific market will be attributed chiefly to the extensive research and development activities witnessed in the field of ion beam technology with the view of overcoming its limitations. Moreover, high penetration of nanotechnology in emerging countries such as China, Japan, and India is also predicted to drive the demand ion beam technology in the coming years. North America, the second-leading contributor of revenue to the global market in 2016, is expected to benefit from the rapid technological advancements in the field of consumer electronics. The rising demand for technologically advanced smart home devices and wearable consumer electronic devices will fuel the demand for small integrated circuits in the region in the near future, driving the market for ion beam technology for applications such as cutting unwanted electrical connections, or/and depositing conductive material to make new connections. Some of the leading players operating in the global ion beam technology market are Veeco Instruments Inc. (New York), Scia Systems GmbH (Germany), Hitachi High-Technologies Corporation (Japan), and Canon Anelva Corporation (Japan). Application of ion beam was rarely found outside the microelectronics industry, up to about a decade ago. However, currently, the ion beam systems are being commonly found in a broad range of applications in the medical science laboratories. Ion beam microscopy is being used in a wide range of material science applications, including specimen preparation and in the generation of 3D visualization. Moreover, the ion beam systems are also used in the field of material science for circuit editing, microstructural analysis and prototype nanomachining. In addition, ion beam technology are also used in order to prepare non-biological specimens of transmission electron microscopes (TEM). Ion beam method increases the locational precision of the TEM specimens, as well as significantly reduce the time required for the preparation of the specimens. The current generation of ion beam instruments are also used for the specimen preparation of atom probe tomography (APT). Furthermore, ion beam based systems are also being used for generating 3D images. Conventionally, dual beam focused ion beams (FIB) are used for 3D tomography studies. FIB systems are preferred in this area because these systems require very little or no specimen preparation and are applicable readily to a wide range of materials in 3D tomography. Thus, increasing application of Ion beam systems in material science is one of the most important factor anticipated to trigger the market growth of ion beam technology during the forecast period from 2017 to 2025. 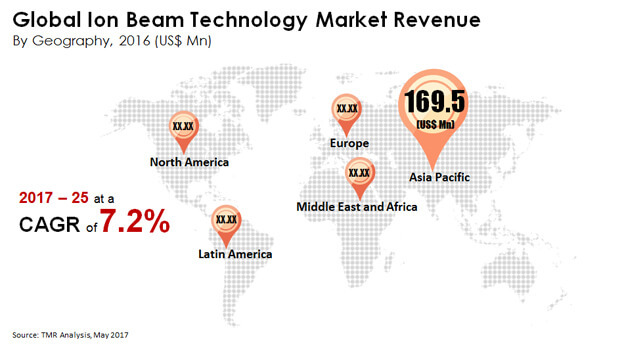 In order to prove a detailed and exhaustive analysis of the market, the global ion beam technology market has been segmented on the basis of technology and application. Depending on various technology of ion beam used in semiconductor manufacturing process, the market has been classified into ion beam etching system and ion beam deposition system. Ion beam trimming has been included within the research scope of ion beam etching system as ion beam trimming helps in localized trimming only. In addition, various application in which ion beam technology are majorly utilized such as frequency trimming of BAW (Bulk Acoustic Wave) filter, surface trimming of SAW (Surface Acoustic Wave) filter, thickness and pole width correction of thin film recording head and coating of dielectric film is also covered within the scope of the report. Moreover, information related to current market synopsis along with future anticipated growth trend of all the above mentioned segment across various regions including Asia Pacific, North America, Europe, Middle-East and Africa (MEA) and Latin America is also highlighted in this report. The major players operating in the ion beam technology market have been profiled competitively across various geographical regions globally. In addition, the leading strategies adopted by the key players to maintain their dominating position in the market, capital expenditure trend and SWOT (Strength, Weakness, Opportunity and Threat) analysis is also provided to give a detailed idea of the competitive landscape. Further, market attractiveness analysis in respect of product type is also furnished in this report in for providing in-depth perspective of the market. The report also provides assessment of different drivers that is impacting the global market, along with the restraints and opportunities that are anticipated to affect the demand of ion beam equipment in the coming years. For each segment (such as product type and application), market dynamics analysis has also been provided in this report. All these factors helps in determining different trends that has been impacting the overall market growth. Moreover, after taking into consideration all this factors, an extensive analysis of the region wise growth parameters of ion beam technology market along with the overall assessment during the forecast period of 2017 - 2025 has been also been furnished within this report. Furthermore, the report includes capital expenditure trend of various SAW and BAW manufacturers for purchasing ion beam equipment in order to give a complete idea of the future anticipated demand of ion beam for RF equipment manufacturing process. Some of the major players operating in the ion beam technology market includes Veeco Instruments Inc. (New York), Scia Systems GmbH (Germany), Hitachi High-Technologies Corporation (Japan) and Canon Anelva Corporation (Japan) among others.